Anne Manera is an illustrator who has created four colouring books and is already working on more to add to her collection. I have been sent pdf copies of two titles (Just Color ! and Floral Mosaic), not hard copies and therefore cannot comment on paper quality, binding type or the feel of the books. Therefore, this review is just about the designs in the books. These books are great for those of you who really struggle with the intricate books currently saturating the market. They would also be ideal for people who have problems with vision and fine motor control, as the spaces aren’t small. The line thickness is medium/thin, so you may need to be a little careful about going over the lines. These designs, though, aren’t ones that you need to really concentrate on, making them ideal if you use while practicing mindfulness, or for the bad days when your concentration is badly affected. Because the images aren’t of specific things like oak trees, fish or squirrels there are no issues with feeling limited to realistic colour schemes, so you really can just pick up a coloured pen or pencil and start colouring. No need to fear messing it up or making it look unrealistic – anxious colourers may find this a blessing. I know the curse all too well of agonizing over choices and worrying about making your natural scenes look perfect. These images would be ideal to practice using watercolours, paints, chalks, or pastels, but are also be perfectly suited to pens and pencils, though you won’t need fineliners unless you’re doodling. The spaces are too large to make them necessary. 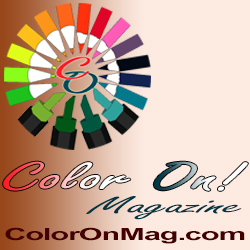 Just Color ! contains 22 images. Each consists of a single type of shape printed in various different sizes and orientations all over the page. 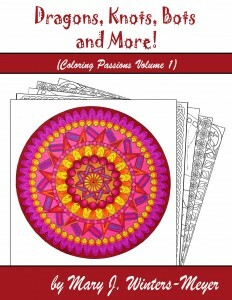 At first glance, this book looks quite simple and somewhat similar to the geometric pattern colouring books many of us grew up colouring as children. However, while the pages can be used very effectively as they are, and simply used to zone out and focus on something that isn’t stressful or worrying, they can also be used much more creatively. Many of the spaces are quite large and could be used to practice shading, blending or even doodling. Those of you with a lot of artistic flair could even use these images to draw in and use the shapes as frames for connected or unconnected images. You could challenge yourself to colour the whole image in one hue or use as many colours as possible. The possibilities are endless! This book isn’t my cup of tea, as I personally love to colour natural, intricate images. 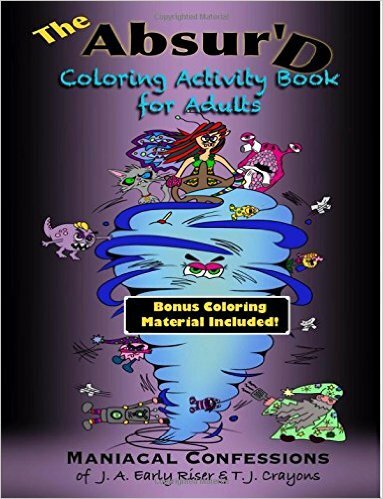 If you’re like me, then this book isn’t for you, but it’s a great book for those who are more artistic and want to combine colouring with drawing and other techniques. Anne is one busy lady! Not only has she created four colouring books and two colour your own calendars, she also runs the Just Color Group on Facebook, where you can show off your colourings and ask for tips and help from some seasoned pros. Lucy is a UK member of my Facebook group, Coloring Books for Adults. She reviews books specifically for those suffering from mental illness. Lucy is able to bring a unique viewpoint to this target group, as both a person who suffers from her own severe anxiety disorder, and as someone who has worked with psychiatric inpatients. You can read Lucy’s blog for more information, or connect with her through Facebook.